"I followed them to the sandlot once after school. I'd never seen any place like it. It was like their own little baseball kingdom or something." I am a softie for a well made baseball movie. The Natural, Field Of Dreams and Eight Men Out are but a few of the finer films of recent memory that have successfully painted the romantic magic that is baseball to a tee, and The Sandlot can easily be heaped on that short stack for it's dead-on portrayal of the same kind of addictive allure the sport had on me as a kid. Director David Mickey Evans, who can be forgiven for having written the screenplay for the horrible baseball-chimp movie Ed, has managed to come up with a winner here. The film is set in 1962 in a small California community, and focuses on the lives of a group of baseball loving boys the summer between 5th and 6th grade. Scotty Smalls (Tom Guiry) has just moved into the neighborhood, with his mother (Karen Allen) and his stepdad Bill (Denis Leary). Scotty has some nerdy tendencies; he's a brainy loner with absolutely no understanding of how to play baseball. One day he follows a group of eight neighborhood kids to the local sandlot and he watches as they do nothing but play baseball, and he secretly wishes he could join them despite his complete lack of ability. One of the kids, Benny (Mike Vitar), kindly urges Scotty to join them, and Scotty's comical ineptness earns him the cruel mockery of the others. But Benny, sort of the spiritual leader of the group, and the most talented, quickly helps Scotty learn to play, and he is soon accepted by the group. It's then that the real fun starts. The remainder of The Sandlot features (of course) plenty of baseball, as well as an encounter with a mythical baseball-eating creature known only as The Beast, an autographed Babe Ruth baseball and enough genuine nostalgic sweetness and humor to make me wish I was a kid again. The 4th of July sequence, where the boys play a magical, once a year night game lit only by fireworks, is beautifully shot, and if that doesn't make you wish you could turn back time, then it's too late for you. The kids are an oddball assortment, and each have some quirky characteristic that makes them easily identifiable and instantly defineable. There's the kid with the glasses, the kid who always says "Yeah, Yeah," the twins who repeat each other, the fat kid, etc. Evans' screenplay never allows these standard movie conventions to become too trite, despite an overabundance of the infamous Home Alone-inspired screams that pop up fairly often in the cartoony final act. It's a strong ensemble cast of relative unknowns, and they all come across very natural and entertaining. There's a lot to like here, and I suspect that The Sandlot may have slipped under the radar of many people. Don't let it pass you by again. Image Transfer Review: Fox has come through with a first-rate 2.35:1 anamorphic widescreen transfer of The Sandlot, and it looks terrific. Colors are well-saturated and rich, and flesh tones remain natural for the duration. Strong blacks give shadows solid delineation, and give the whole film an excellent contrast level. Compression issues and edge enhancement are minimal. The flipside features a nasty pan-and-scan version that pales next to the wonderful 2.35:1 transfer. Audio Transfer Review: The remastered 5.1 track here sadly never lives up to it's full potential, but that's not as bad as you might think. The Sandlot audio transfer is full across the front channels, but it lacks any significant rear cues. On the plus side, the abundant 1960s' songs that pepper the soundtrack sound crisp, and dialogue is mixed well. This is a dialogue-driven film, and isn't the type that necessarily needs a large, swirling sound field to be effective. English and French 2.0 tracks are also provided. Extras Review: A quickie EPK featurette (05m:47s) is devoted to snippets of interviews with the child stars of The Sandlot, and as expected, this piece doesn't offer much in the way of substantial insight. It's short and fluffy. The remainder of tepid extras include a set of 7 television spots, an anamorphic 2.35:1 theatrical trailer, subtitles (English, Spanish) and 28 chapters. 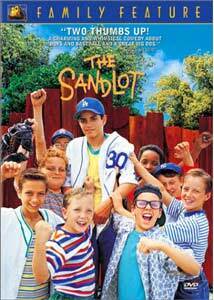 The Sandlot is one of those easily overlooked films from the early 1990s that wears it's nostalgic heart proudly on it's sleeve. It nicely captures the youthful adoration and worship of baseball, plus it's just a very sweet film. What more do you need?